John Stonehouse, the Labour MP who faked his own death, spent months rehearsing his new identity, according to newly released official papers. He pretended to have drowned off Miami Beach in 1974, but was later found in Australia with a false passport. He claimed to have had a breakdown, but a psychiatric report, released to the National Archives, reveals he had been using a dead man's identity for months. Mr Stonehouse had fled to start a new life with his mistress. The, MP for Walsall North, a former minister, left a pile of clothes on Miami Beach on 20 November 1974, to make it seem as if he had drowned while swimming. This followed the collapse of a series of fraudulent businesses he had established. He began to dislike the personality of Stonehouse and came to believe that his wife, colleagues and friends would be better off without him. But on Christmas Eve, he was picked up by police in Melbourne, where he had gone in an attempt to establish a new life with his former secretary, Sheila Buckley. He was found to be carrying a false passport in the name of Joseph Markham - the dead husband of a constituent - and claimed to have suffered a "brainstorm". However, the newly released psychiatric report reveals he had been using Markham's identity for months. It says: "He spent short periods posing as Mr Markham, a private and 'honest' individual, which apparently led to reduced tension. "He began to dislike the personality of Stonehouse and came to believe that his wife, colleagues and friends would be better off without him. "He therefore devised his escape to get away from the identity of Stonehouse. "He thought of suicide but, deciding that this was not the answer, devised a 'suicide equivalent' - his disappearance from a beach in Miami." Mr Stonehouse consulted a psychiatrist to support his claim that he had suffered a mental breakdown as part of his fight against extradition back to the UK. However the findings - which the psychologist presented to the Australian authorities - were secretly passed by officials to the British High Commission. After a legal battle, which saw Mr Stonehouse invoke his right as a Privy Councillor to present a petition to the Queen, he was finally returned to Britain in June 1975. In August 1976, he was sentenced to seven years' imprisonment after being found guilty of 18 counts of fraud, deception and theft. He was released after three years on grounds of ill health. The files, released on Thursday, include a letter he wrote to Commons leader Ted Short, in which he angrily blamed the press for his downfall. There is also a letter from his brother, William Stonehouse, to Home Secretary Merlyn Rees, lamenting the conditions in which he was being held at Blundeston Prison, such as cleaning out lavatories. 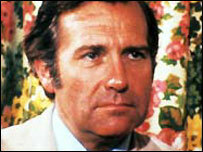 Following his release, Mr Stonehouse married Ms Buckley. He died in 1988.